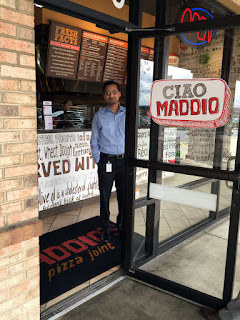 This location of Uncle Maddio's is located at 4745 Ashford-Dunwoody Rd, Atlanta GA 30338 at the end closest to Ashford-Dunwoody in the big Perimeter Village shopping center anchored by Walmart. 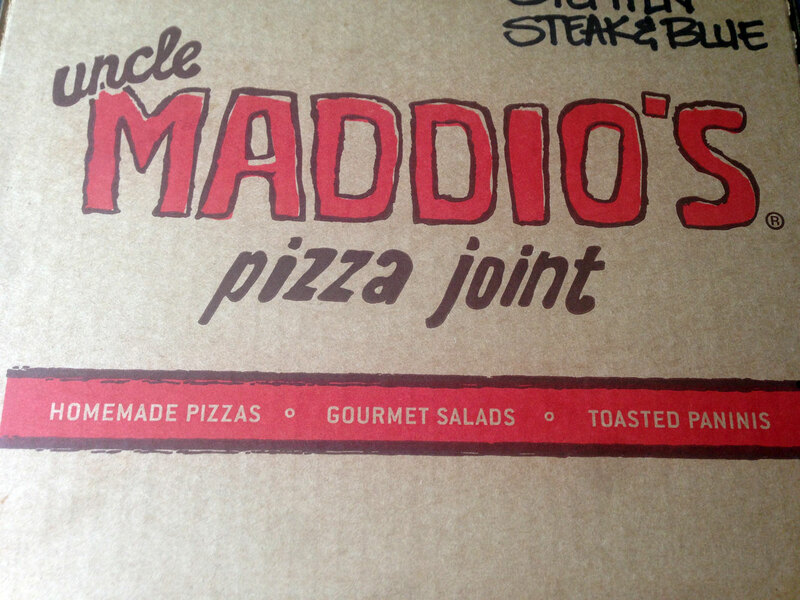 Uncle Maddio's is an interesting concept. 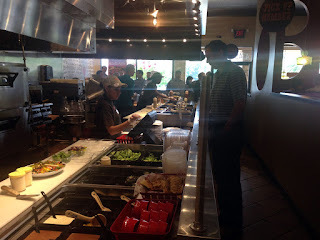 As the first reviewer noted, it's similar to a Subway in that you choose a crust (white or wheat), one of six sauces, then toppings from a huge selection of fresh ingredients with several vegetarian options - and for the health conscious they use organic spinach/field greens and have gluten free options AND the chicken they use is free-range. 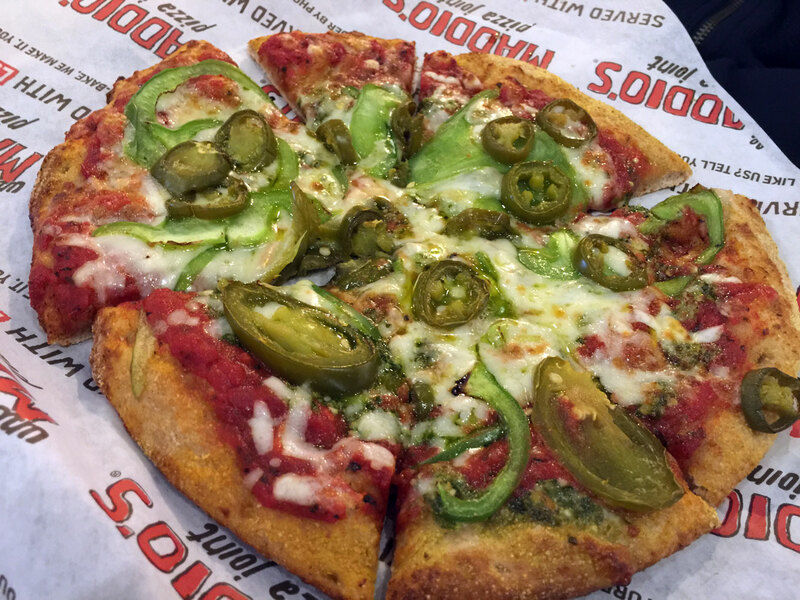 Or if you're too lazy to build your own, there are about a dozen other options for pre-configured pies, sandwiches or salads. 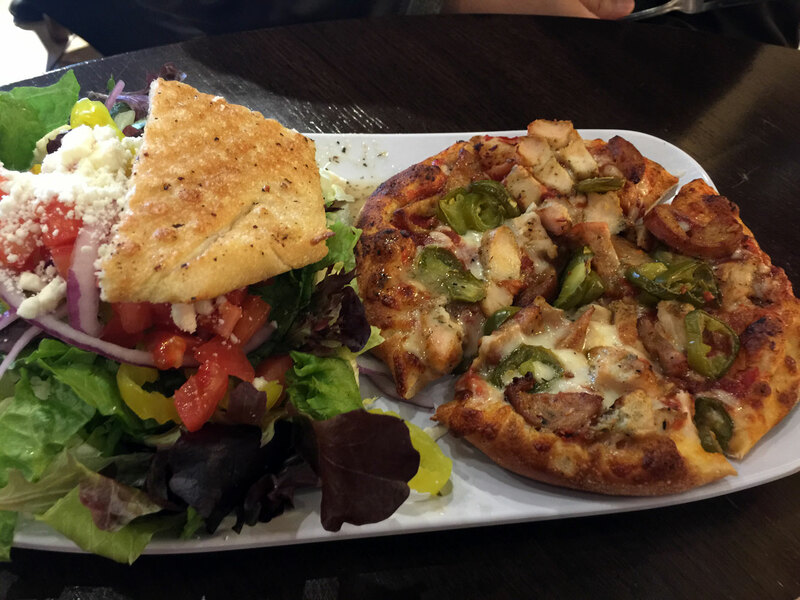 Choose a drink or any sides and/or appetizers and sit in the well-maintained, clean dining room. 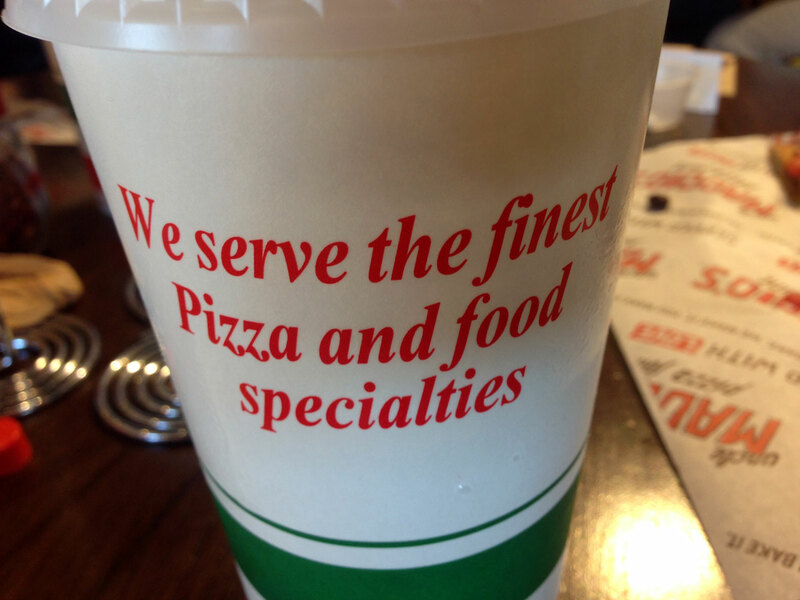 Your food appears a few minutes later. 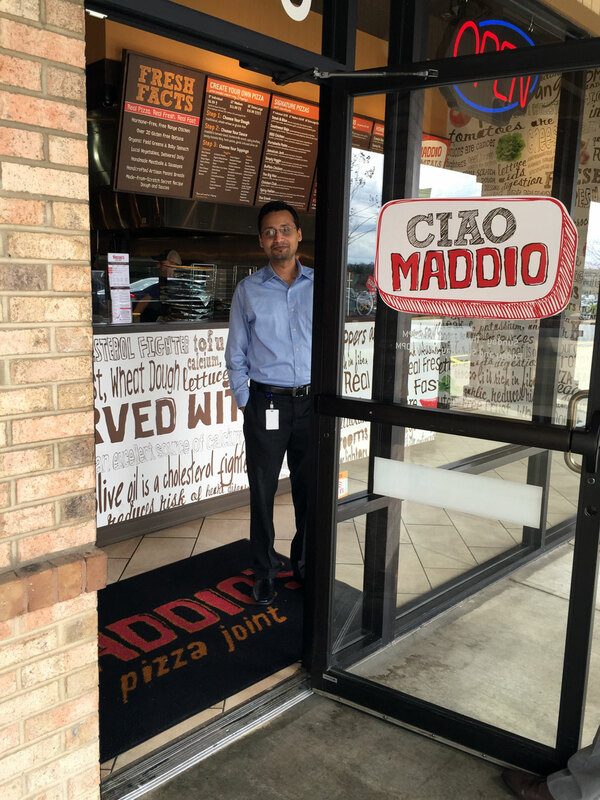 The staff were very efficient and friendly, yelling "Ciao Maddio's!" (similar to "Welcome to Moe's!") when people enter. Portobello Pesto: (herb pesto sauce, mozzarella, portabella and white mushrooms, feta cheese, Roma tomatoes and fresh basil) - this was perhaps the weakest of the three. The portabellas had little of their usual distinctive flavor and the button mushrooms needed a bit more cook. 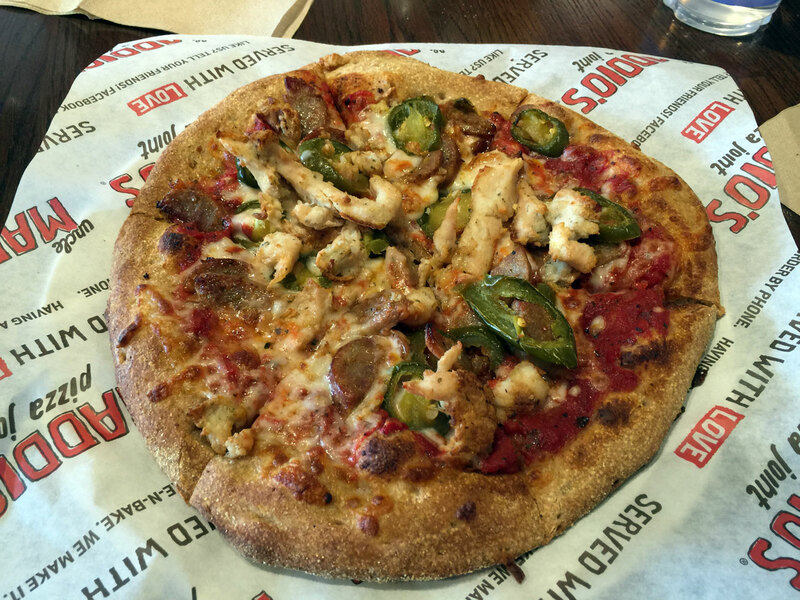 The pesto was also lacking in some of the punch you normally find in a pesto pizza - it may have just needed a bit more coverage - hard to say. We ended up with leftovers of this pie. 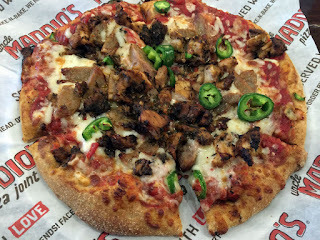 Jamaican Jerk: (tomato-basil sauce, mozzarella, grilled jerked, free-range chicken, red onions, green peppers, pineapples and cilantro) - this was a very good pie with plenty of chicken and fresh pineapple. I wish the chicken had a bit more jerk seasoning but that's typical - I prefer the strong punch you get from getting the real thing at Caribbean restaurants. The fresh red onion gave this pizza a distinctive texture and flavor so while I normally forgo onions at lunch (to save my coworkers), I would recommend you leave them on this pie or get something different. The pineapple provides just a bit of sweetness and acid to off-set the allspice in the jerk. We all liked this pie. Steak & Blue: (olive oil, mozzarella, blue cheese crumbles, grilled all natural angus steak, Roma tomatoes, garlic, spinach, fresh basil and balsamic glaze) - for this a single word - WOW! 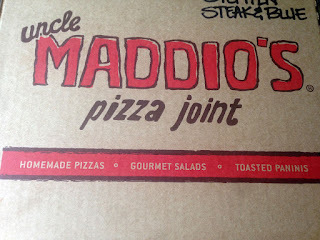 I knew this was going to be something special when they started slathering a large handful of oiled garlic on the crust. The combination of the garlic, grilled steak and blue cheese provides that heady aroma and flavor you sometimes get with the perfect steak. The balsamic glaze drizzled on top adds just the right amount of acid and sweetness to balance the fats of the cheese and meat. Perfection! This pie reminds me of the garlic, gorgonzola, pancetta and sliced new potato pie we made at the ill fated Mi Spia in Park Place. The unlikely combination has a synergistic effect that satisfies so many different sensations with each bite. 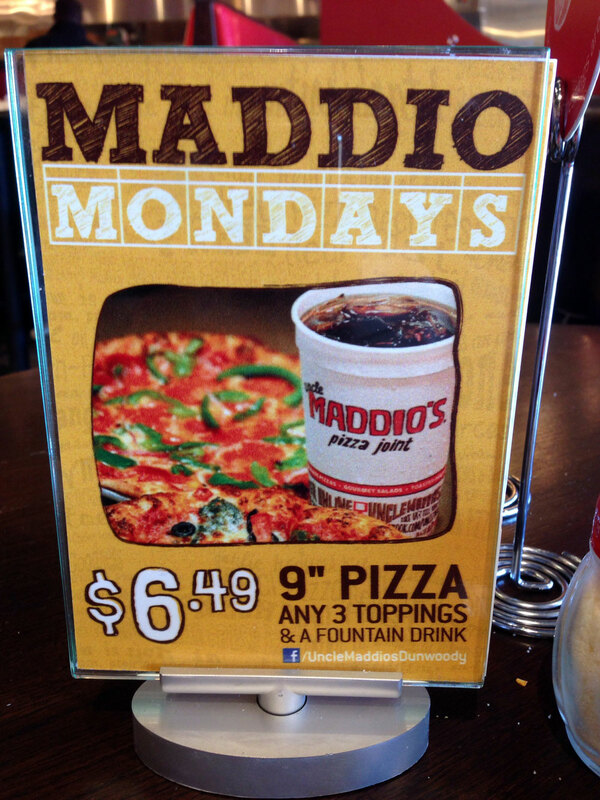 The best deal is the Maddio's Monday (used to be $6.49, I believe it recently went up to $6.95). In general I liked the experience, staff and environment. 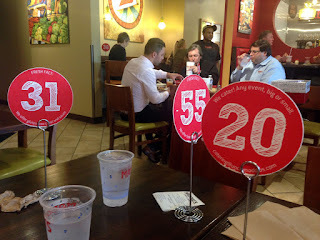 It seems like a good place to bring a group, although with the counter ordering your first member may be finished before the last member gets his/her food, but that's fairly typical at Subway or other, similar concepts. Drink refills are free at the help-yourself counter and there's plenty of grated cheese, red pepper flakes and oregano in shakers if you're so inclined. I think that even with 10 people we were in-and-out in less than an hour. 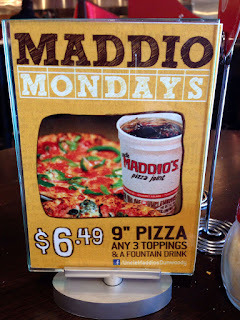 Recently this location started serving beer - alas with the much better Your Pie nearby, I'm not sure if Maddio's will survive the build-it-yourself pizza wars in the Perimeter area.